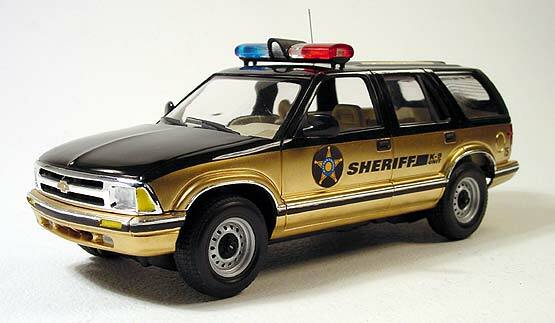 Here's another in my series of SUV police vehicle replicas. 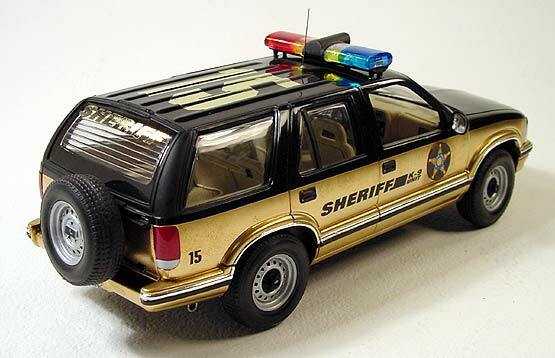 Built back in 1996, I used Ertl's snap kit '95 Chevy Blazer and added various police car parts from the parts box. I also swapped the grill for the base model style found in the Ertl S-10 pickup kits and made my own resin wheels from a mold taken from the spare tire molded into the chassis. The spare tire carrier is also scratch built. The graphics are custom dry transfers which I designed on the computer. This model was featured in Terry Jesse's "light commercial" column in Scale Auto Enthusiast magazine.